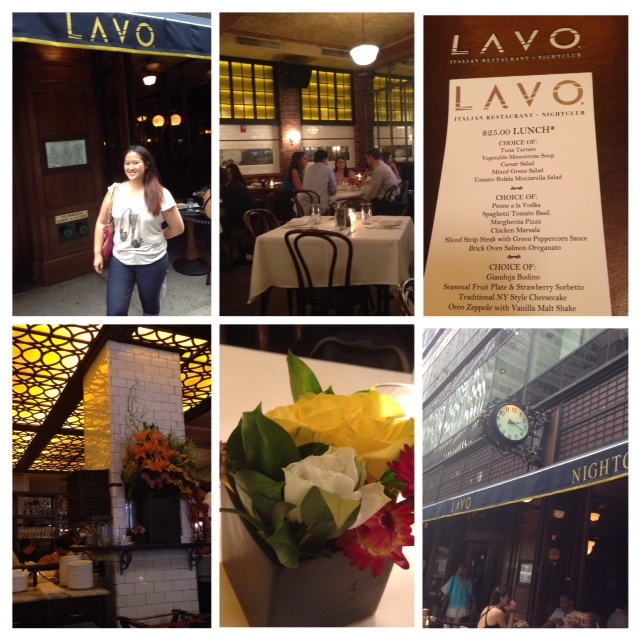 I recently had the opportunity to dine at the fancy Lavo (Nightclub and Restaurant ) for Restaurant Week lunch. Inside, it’s beautiful, elegant and spacious. 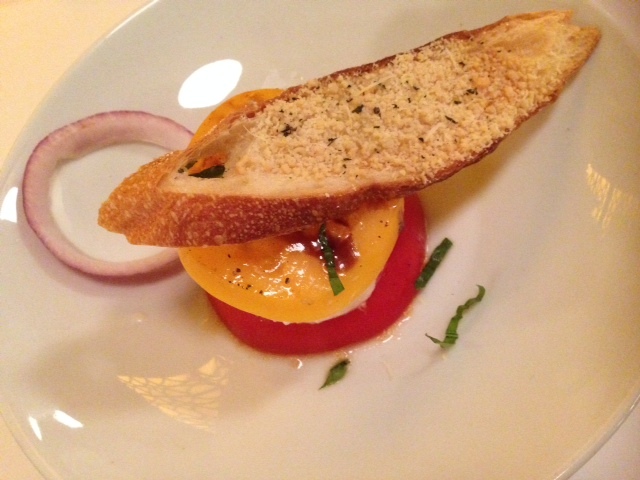 For my appetizer, I chose the Tomato Bufala Mozzarella Salad. It consisted of yellow and red tomato slices with mozzarella in between, topped with Parmesan-crusted crostini and onion on the side. Even though it was a simple dish, the presentation was lovely and I really liked the pop of colors. It tasted quite wonderful as well– Fresh, flavorful, and delightful. For my main course, I had the sliced strip steak with green peppercorn sauce. 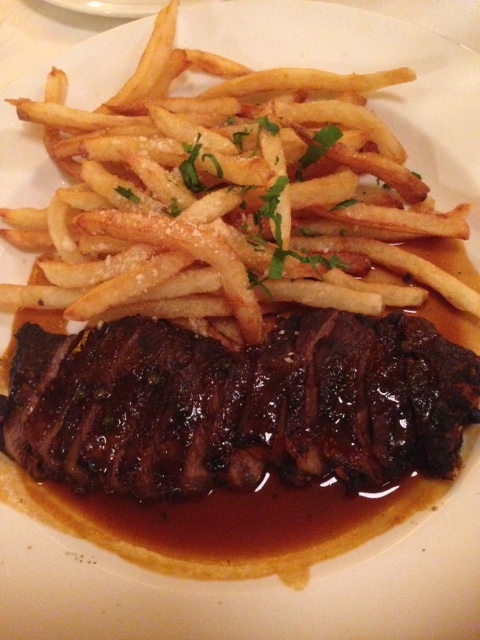 The steak, already cut was absolutely delicious– Juicy, tender with a mouthwatering sauce. The only complaint I had was that the meat had quite a bit of fat on it still and I prefer lean cuts of meat. The french fries had sprinkle of Parmesan and were skinny (just the way I like them), warm, perfectly crispy and incredibly good. 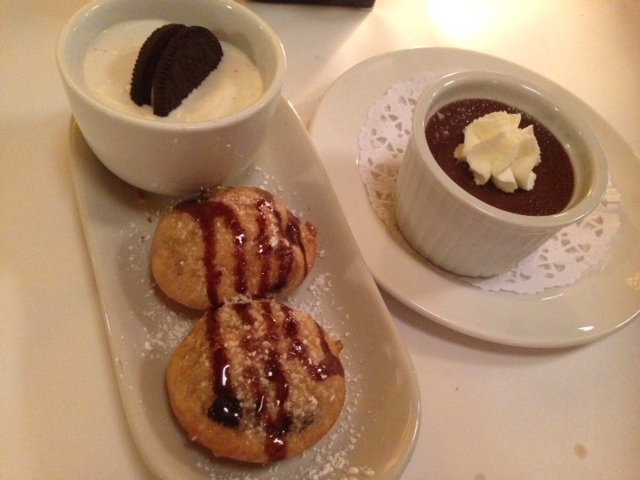 My chosen dessert was the Oreo Zeppole with a Vanilla Malt Shake, while my friend had the Gianduja Budino, a chocolate pudding. The pudding was rich and extremely chocolatey but I preferred the zeppole. The oreo zeppole were delectable warm little morsels that melted in your mouth. The zeppole had an oreo filling with fried dough around it… They tasted sweet and perfect. The vanilla shake came in an adorable little cup with an oreo inside. The shake combined well with the zeppole, but each were delightful on its own. 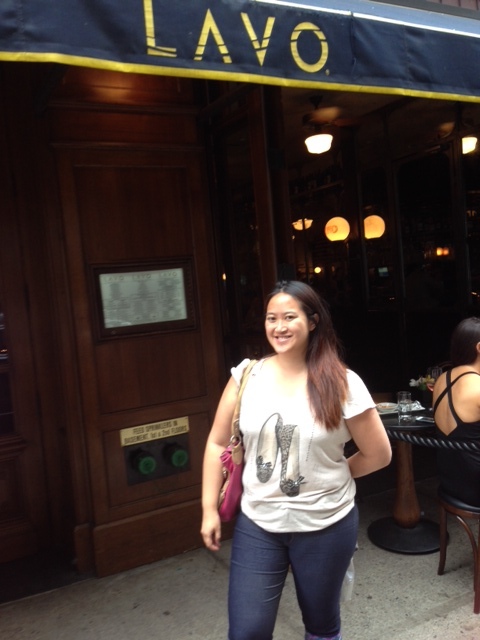 I truly enjoyed my meal at Lavo! The service was pretty good, though it took awhile to get mayonnaise (for my fries) and I had to ask more than once. Otherwise, a lovely dining and culinary experience.